On Friday a St. Louis judge found former Police Officer Jason Stockley NOT GUILTY in the shooting death of Anthony Smith, a black suspected drug dealer. Local St. Louis protesters called for “mass disruption” after the former police officer was acquitted. Outraged protesters took to the streets of downtown St. Louis following the court’s decision. Angry protesters shut down Market and Tucker Boulevard in downtown St. Louis on Friday. 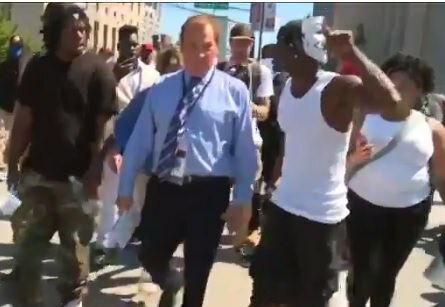 Local FOX 2 reporter Dan Gray was covering the protests in downtown St. Louis. An angry protester in a Colin Kaepernick jersey started screaming at Dan Gray, the mob then pushed him out of the area and chased him down the street. The attack was captured by Rebelolutionary Z.
Dan Gray got pummeled with water bottles as he fled the area! @DanGrayTV Is Dan Gray OK??? @FOX2now ??? Did ya leave ya boy to get jumped? Wth? Is he OK? Dan Gray described the sheer terror he experienced after the far left mob turned on him!